Our dorm poster of the ten time Platinum artist Bob Marley is the perfect college decoration for anyone from art majors, to die hard Marley fans. 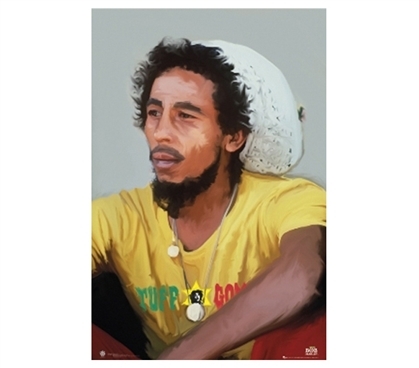 Instead of an enlarged photograph, our 23 x 36'' poster of Bob Marley is actually and enlarged painting of the singer. It doesn't matter how long you've been a fan of this legendary singer, because there's no way you can go wrong with a dorm poster of such an iconic figure. Of course our poster displays the classic Jamaican colors or green, yellow, and red in a blurred and artistic style. Wall decor for dorms can come in many forms, but our cheap college posters are one of the easiest ways for you to make you dorm room less plain, and more personal. Marley fans and memorabilia collectors must add this college poster to their dorm room decoration supplies. Decorating your college dorm room doesn't need to be costly or complicated with our dorm store's extensive poster selection. Whether you have One Love for Bob Marley, or just need some cool dorm room decoration, our college poster will meet your musical and decorative needs.